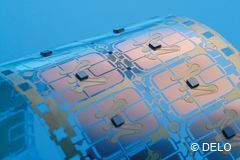 In the RFID flip-chip process, the adhesive has the task to reliably fix the microchip to the RFID antenna at a defined position. For this purpose, DELO supplies non-conductive die attach adhesives or anisotropic conductive adhesives. 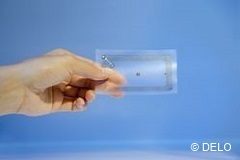 We are the market leader in adhesives for the flip-chip process in RFID applications. The adhesive does not only take mechanical tasks, but also establishes the electrical contact. The product range was specifically developed for reliable contacting with short curing time in the production process.